Incorporating stories from his own experience and anecdotes from other innovators and disruptive businesses-including Richard Branson, Steve Jobs, Elon Musk, YouTube, Circ du Soleil, Odor Eaters, Iams, Silly Putty, and many more-Samit shows how personal transformation can reap entrepreneurial and professional rewards. Disrupt You! offers clear and empowering advice for anyone looking to break through; for anyone with a big idea but with no idea how to apply it; and for anyone worried about being made irrelevant in an era of technological transformation. This engaging, perspective-shifting book demystifies the mechanics of disruption for individuals and businesses alike. “DISRUPT YOU! is an inspiring Cliffs Notes (if you know what that is) for all serious entrepreneurs and innovative managers looking to launch a new company or new product. A must-read for all start-up founders, this is the best book I know for increasing a start-up's likelihood of financial success.” —Brian Solis, author of WTF! “What Jay Samit empowers you to do is nothing short of mercurial: to predict the market, disrupt yourself, and position your business for exponential growth. This is your chance to leverage his years of leadership at start-ups to global media companies, such as Universal Studios and Sony. 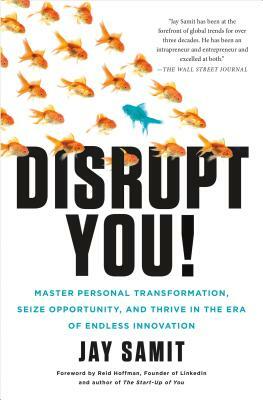 If you want to collapse time, minimize risk, and accelerate success, buy DISRUPT YOU!